Special Edition, limited in production. Luxurious textured marl fabrics, rich blue tones and a mini-print chevron hood lining, the Pioneer Orkney is beautifully crafted. The stylish gloss blue graphite chassis and tan leatherette bumper bar and handle add to the feeling of luxury. In addition, the Special Edition Orkney Pioneer comes with a stylish co-ordinating changing bag and luxurious seat liner. Suitable from birth to 25kg, this Pioneer is the complete package and is ideal for newborns through to toddlers. Use the carrycot as a lie-flat pram or for overnight sleeping. Then, as your baby grows, switch to the multi-recline seat unit to use your Pioneer as a rearward or forward-facing pushchair. This Special Edition Pioneer comes with a luxury seat liner, with soft fur on one side and coordinating fabrics on the reverse. A stylish matching changing bag is included too. 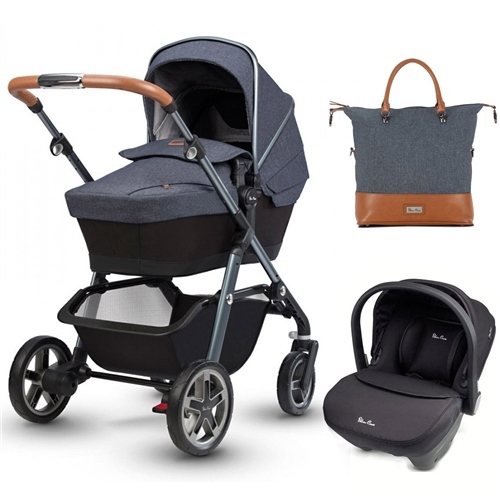 Add the Simplicity car seat to the chassis to create a complete travel system. Built for adventure, the Pioneer features large tyres and a tough four-way suspension ensuring a smooth ride for baby wherever you choose to explore. Other great features include an extra-large basket providing lots of storage space. Pioneer Special Edition Chassis - Orkney comes with an exclusive graphite chassis for a unique maritime finish. Luxury Tote Bag, with faux leather. Includes pram loops and a detachable shoulder strap. Luxurious Special edition marl weave finished in rich blue tones, inspired by the sea.